This model covers the Chalk of Southern England, as far north as The Wash (Figure 1). Conventional geological modelling work within the BGS concentrates on capturing formational surfaces, and is unable to capture geographical and stratigraphical variation of the physical properties that define formational units. For the Chalk and many other geological units, abundant observational evidence from boreholes and outcrops shows that whilst the lithostratigraphy may be traceable over wide areas, there may be significant variability in the development of key physical properties (in the Chalk, particularly hardness and muddiness). This variability largely reflects the variable effect of basin architecture and palaeogeography on the range of environmental processes that acted to create the set of geological conditions responsible for the deposition of a particular geological formation. In some cases, predominantly north of The Wash and outside the scope of this project, post-depositional processes (e.g. pressure solution) may also affect the hardness and thickness of Chalk successions. The Chalk is the major aquifer for southern England, but with dense population and industrial development, it is also vulnerable to pollution. Many major civil engineering projects occur wholly or partly within the Chalk (e.g. Channel Tunnel, Cross-Rail). Understanding the nature of intra-formational variation in physical properties is key at two levels: 1) it potentially identifies broad geographical regions (domains) across which the physical properties of a unit might differ in one or more ways from adjacent regions; 2) it identifies local regions where a unit has atypical features. Academically, such information is valuable for understanding geological processes that produced particular facies types, and the model will function as an engine for generating testable hypotheses about the depositional development of the Chalk. From an applied perspective, understanding site-specific and larger (domain-scale) variation in Chalk physical properties is hugely valuable for developing more sophisticated hydrogeological models of the Chalk, and particularly for understanding the role of stratigraphy and structure on near- to deep-subsurface fluid movement and solute transport. For engineering geology applications, understanding site specific variability within a geological formation is crucial, particularly the extent to which a given site conforms to or departs from the median predicted characteristics. 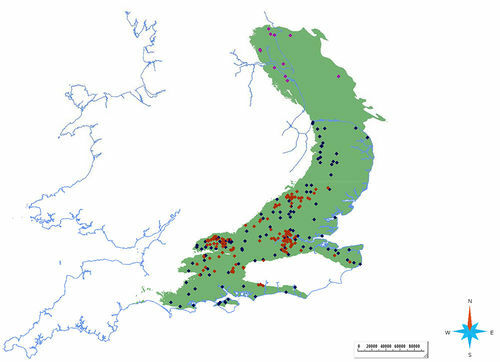 Figure 1 Map showing the study area (green) which corresponds to the outcrop and subcrop of the Chalk Group. Coloured dots indicate borehole control points: most of the modelling effort so far has been south of The Wash. This page was last modified on 7 May 2015, at 13:10.